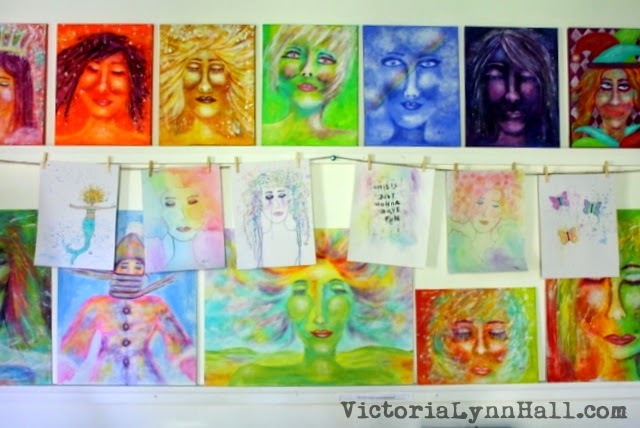 My art on display in my studio. 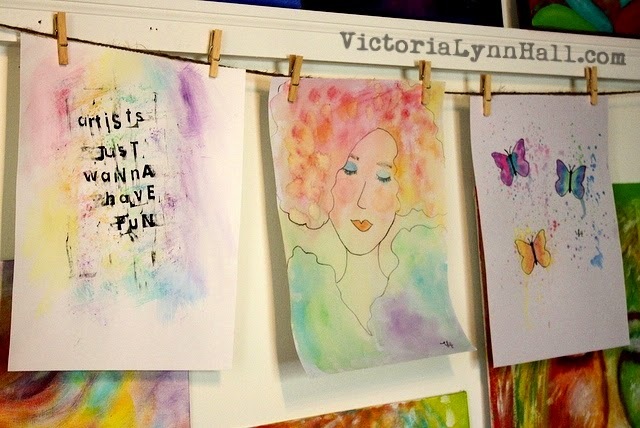 A "clothesline" for my watercolors. It was a super easy project. 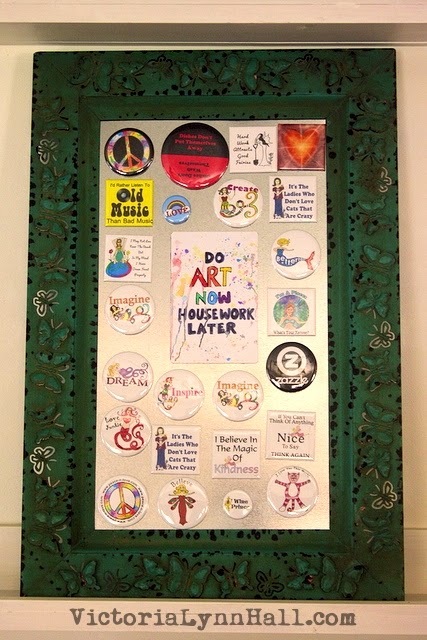 I just strung some rope using push pins and then attached my paintings to them with fun mini clothespins I got at the craft store. By the way, the acrylic paintings on that wall are resting on brick molding which was easy to install and provides just enough of a ledge for canvases and canvas panels. 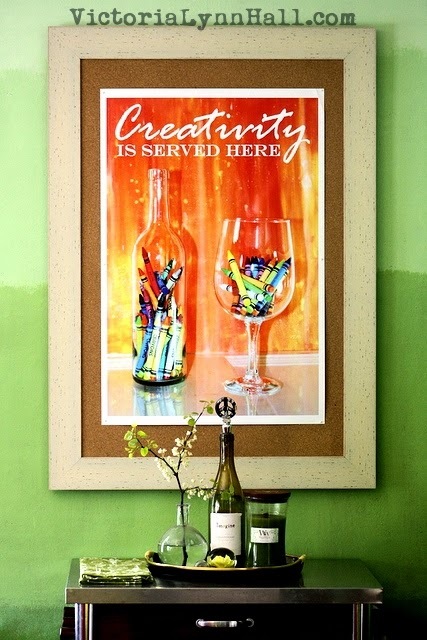 Being someone who loves to create and collect all kinds of art, I am always looking for creative ways to display it. I am a big fan of ledges and shelves or any solution which allows me to easily arrange and rearrange my collections. 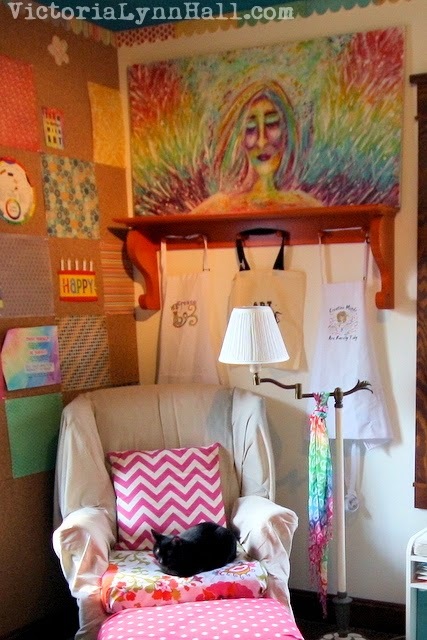 A couple weeks ago I shared the art shelf in my hallway and you may remember the shelves Hippie helped me make and install in my home gallery. Really, you can't have too many shelves. 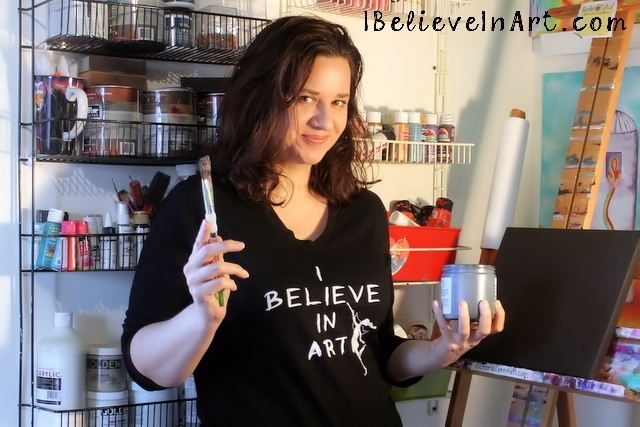 Another shelf in my studio holds my "Angel Of Imperfection"
painting as well as bags and aprons. 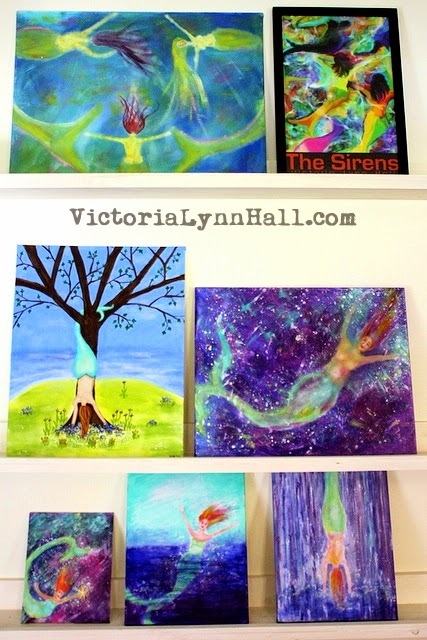 My mermaid art on display in my home gallery. I am also fond of cork surfaces as a more informal way of displaying prints, postcards or just about anything that inspires me. on a bulletin board in my dining room. 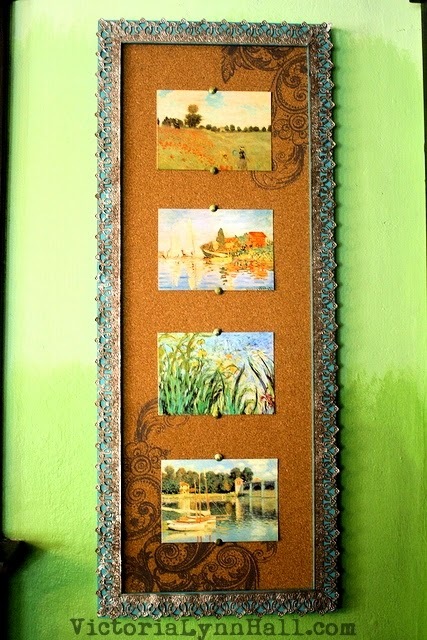 Claude Monet art postcards pinned to another cork board. 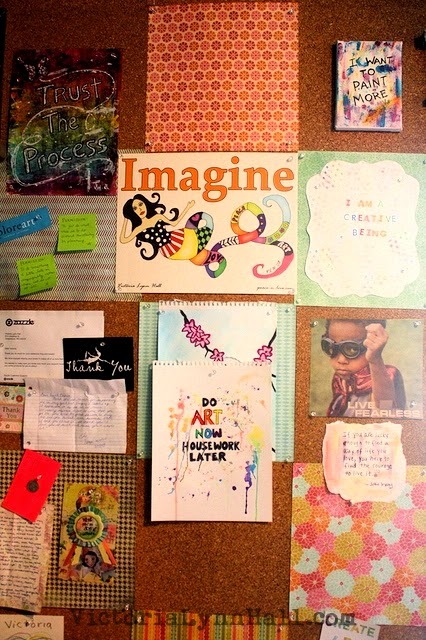 The cork tiled wall in my art studio holds art and inspiration. 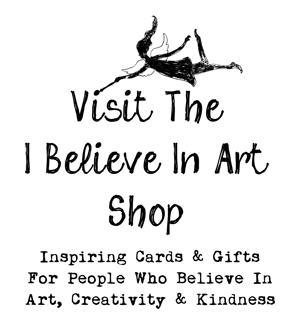 Magnets available at my Zazzle shops. 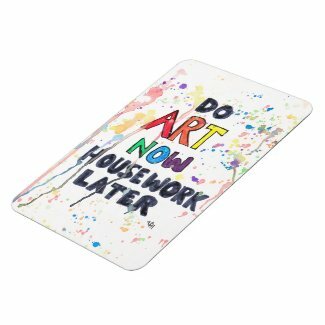 Some might say that magnets aren't art but I think anything that you love and choose to display in your home is art. It doesn't always have to be behind glass or in a gilded frame to be special or draw your eye. 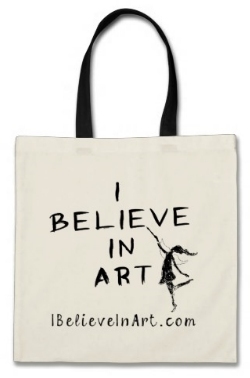 Art is supposed to be fun, remember?, and displaying it should be too. You are inspiring me to finally follow through on my own plans to install a ledge & a clothesline for displaying artwork (my own & my daughter's.) Both projects have been languishing on my to do list for quite some time. I also bought cork tiles long ago, & they've been sitting up on my closet shelf, waiting to be installed. How did you adhere/secure yours to the wall? Hi Lisa. I used construction adhesive to secure the cork tiles to the wall. They aren't going anywhere! :) Have fun with your projects. I hope you'll share some pictures when you're done. Thanks for the tip, Victoria! My home is so entrenched in its state of "needs improvement" that I'll only share pics if I make enough progress on overhaul projects...ha ha! In the meantime, thanks again for all of the inspiration.